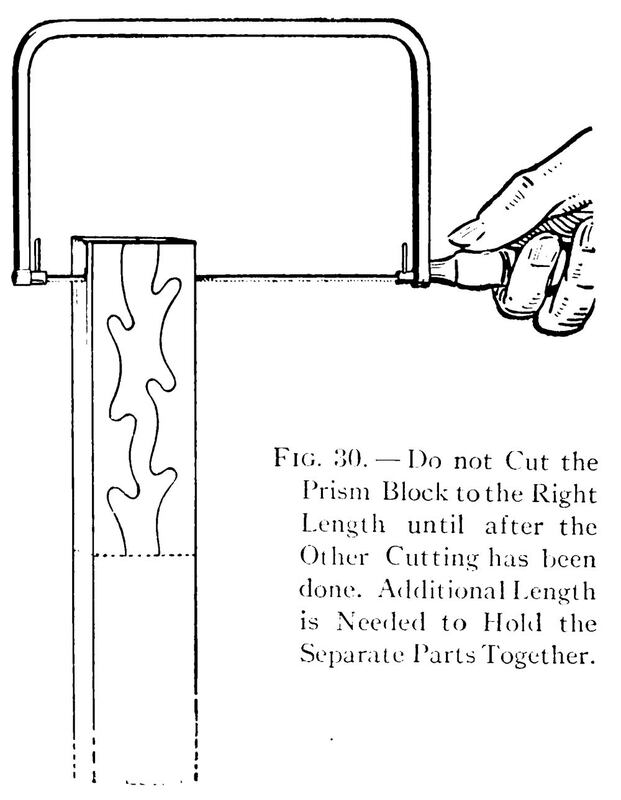 The Prism Puzzle presents one of the most interesting of the simpler scroll-saw problems. The first thing to do is to prepare a stick 1 1/2 inches square. The length of the finished block will be 4 3/8 inches, but do not cut the block to this length until after the rest of the cutting has been done (Fig. 28). If you do separate it, there will be no way of keeping the parts together while cutting, and there will be nothing to hold the block by. Plane the sides of the stick square and smooth, and square off one end. Mark off the distance of 4 3/8 inches from the squared end, upon each side of the block. Then draw the curves shown in Fig. 29 upon two adjacent sides of the block, making a tracing of the pattern and transferring it to the block. In cutting, it will be best to support the block in a vertical position and cut down as shown in Fig. 30. There are two important things to do. 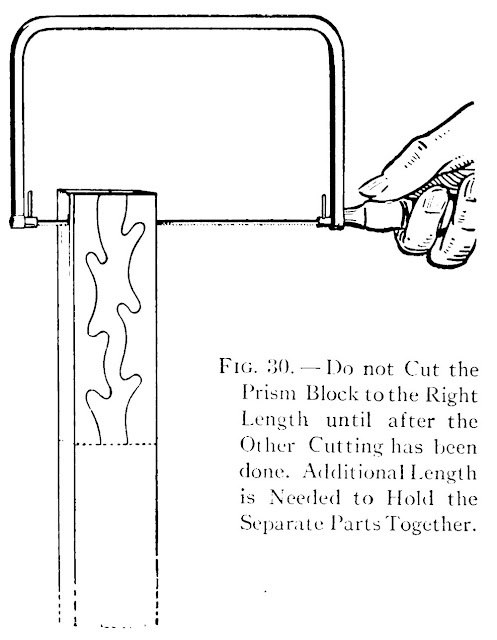 Hold the saw so that the blade will cut horizontally and always parallel to the sides of the block, and cut exactly upon the lines. Figure 31 shows the nine blocks into which the block is separated in the process of cutting. The centerpiece is the only piece that is irregularly shaped on all four sides; therefore, this is the piece to begin with in assembling the block. Find two pieces that will fit upon opposite sides of it, and fit the three pieces together. Then find three pieces that will fit together each side of the center three pieces, slip them into position, and the block will be put together. 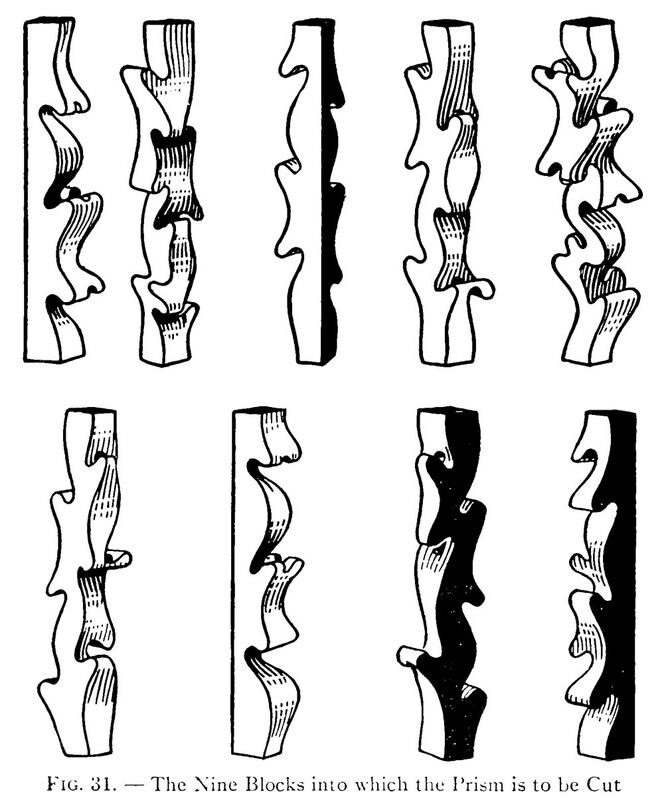 There is a trick to locking the pieces one inside another, even when the correct positions have been discovered. You must get the knack of putting them together through experimenting. Publisher Boston: Lothrop, Lee & Shepard Co.